I am in looooove with these scooooones. If you don’t love scones, you’re wrong. Just kiddiiiing you’re entitled to your opinion and whatever (or am I kidding??) but just know that I strongly disagree. They’re crumbly, buttery perfection. Now I know that if you try to say you don’t like butter, you’re lying. Isn’t loving butter genetically engrained into every human or something? I feel like it is. I’m pretty sure. I also really, really love almonds. I would say a much larger than average percentage of my diet is composed of almond products and I’m very emotionally in touch with my almond-consumption. Trader Joe’s just restocked their almond butter and I almost cried tears of joy upon discovering this, for example. As long as we’re talking ingredients here, I’m also quite the honey fan. And can’t go wrong with oats. Essentially, these are my ideal Emily-scone. I got the idea for these from this lovely blog (how GREAT are her photos?!) with a few little tweaks here and there to the recipe. 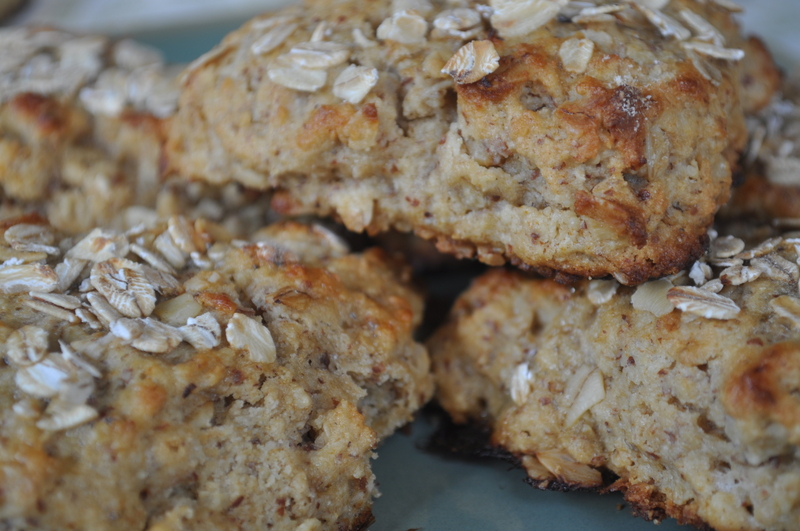 I loved the idea of toasting the oats before using them in the scones. This step can be skipped, of course, but I recommend it! The toasty flavor it adds is reeeally niiice. Also: if you’ve never made your own jam, I highly recommend it as well. Like. Right now. It’s summer! There are copious berries available! Go buy some and throw ’em on the stove! It’s so easy! This recipe truly is as “magical” as the title claims. So simple. And so, so delicious. Start by preheating the oven to 375°. Spread your oats onto an ungreased baking sheet and toast them for about 7 minutes or until they’re fragrant. Take them out, let them cool, set aside 2 Tbsp. of them aside to put on top of your scones later, and increase the oven temperature to 450°. In a small bowl, whisk together the egg, yogurt, milk and honey and set aside. In a separate bowl, mix together the dry ingredients (the rest of the oats, almond meal, flour, baking powder, baking soda, and salt. Cut in the cold butter chunks (yeah, I hate the phrase “cold butter chunks” as much as you do, believe me) with a fork–or a pastry cutter, if you’re fancy–until almost all the way combined. You want the mixture to be mostly crumbly-looking; it’s okay if you can still see some butter pieces in there, just as long as they’re not too aggressively large. Make a well in the middle of the butter and dry-ingredient mixture and pour in the wet ingredients. Mix until juuust combined. Don’t over-mix! Plop the dough out of the bowl onto a floured surface and form into a round, even 1″ layer. Using a pizza cutter (or a knife…but where’s the fun in that, hmm? ), slice into 8 even, wedge-shaped pieces and space them out evenly onto a lightly greased baking sheet. In a teensy little bowl, whisk together an egg white and 1/2 tsp. of honey until combined and brush on top of each scone. Sprinkle them with your reserved oats and stick ’em in the oven for 8-10 minutes or until the edges turn that beautiful, light golden brown. In a medium saucepan, bring the berries and honey to a boil. Reduce the heat to medium-low and stir frequently for about 5 minutes. Using a potato masher, smush the berries until they’re a nice, jam-like consistency (but leave some berries intact for texture purposes!) and add the chia seeds. Keep stirring frequently and let the mixture continue to simmer until you get to a good consistency–about 15 minutes or so. It might seem a little runny, but keep in mind it’ll thicken up once it’s cooled down. Remove from heat, add vanilla, and let cool. Place it in a nice little jar, stick it in the fridge, and enjoy! See how easy that was? 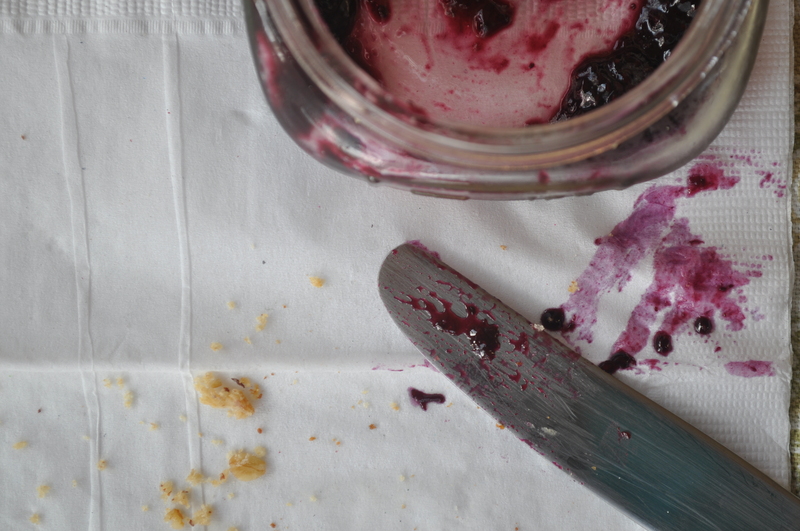 Seriously guys, you haven’t really tasted jam until you’ve had homemade. Unreal. 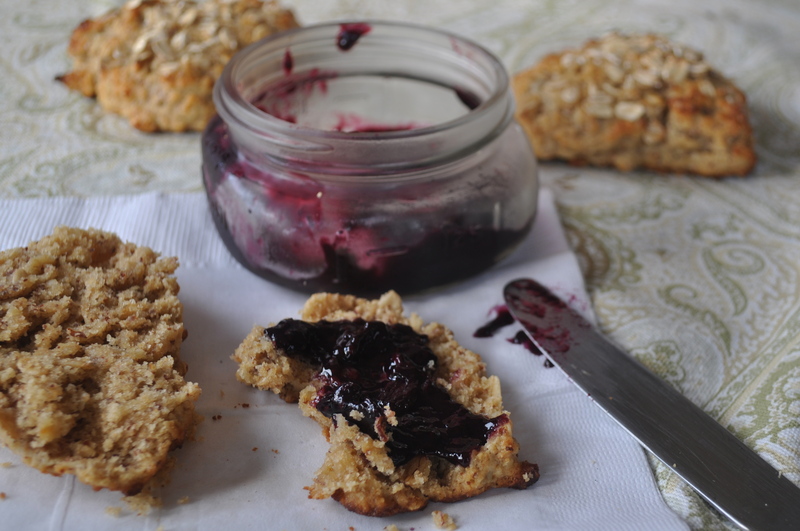 Shoutout to mah girl Emilie for talking to me repeatedly about scones and chia seed jam recently and therefore being the inspiration this scone-and-jam-making frenzy. Also to my lovely friend Joy for requesting the recipe, and therefore forcing me to actually post in a timely manner! All good things. Hope your August is going swimmingly, friends. 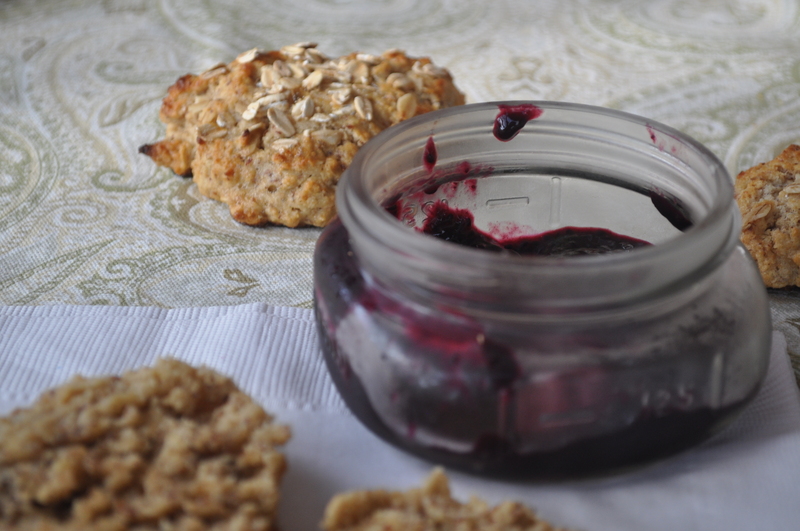 Categories: Breakfast, Snack | Tags: almond, breakfast, chia seed, honey, jam, oat, scones, snack, vanilla | Permalink.